The Fashion Frenzy for our Furry Friends in Toronto are raising money for canine cancer. This article promoting the event, The Dog Days of Winter, brings up a good point. 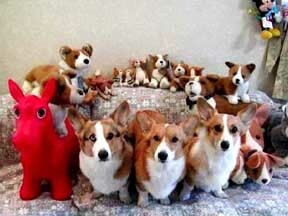 “The idea of dressing up dogs can be deeply divisive. Some people think it’s cute, others contend it’s traumatizing for the animal—and then there are those who think it’s just plain stupid.” CUTE! CUTE! STUPIDLYAMAZINGLYCUTE! What do you think? 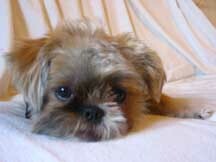 On that note, Cindy wrote to me about her dog Stewie, a Brussels Griffon and Shih Tzu mix. Stewie is named after THE Stewie from the Family guy, which is simply amazing (Please note stellar quotes such as: “oh yes Meg, yes yes, yes everything was going swimmingly for you until this … yes yes this is the thing that will ruin your reputation, not your years of grotesque appearance or awkward social graces or that Felix Ungerish way you clear your sinuses … no no no, its this … do you hear yourself talk? I might kill you tonight …”). With inspiration like that, this small dog is surely destined for great things. It’s confounding that Stewie was “the only one in the litter that no one wanted.” Are people taking crazy pills??? They sure are missing out. I can tell from these photos that he is a gem. And, to top it off he is simply dapper! He understands Spanish and English and like clockwork, every night around 4am he crawls into bed with Cindy to cuddle. He even “did a little dog modeling for Little Pampered Pets.” He’s the one in the army shirt and blue jacket. I will have to do a more through report on Little Pampered Pets in the future. What a site! Moving along, here’s Stewie!!!! That is the cutest dog I have ever seen in my life! He very well may be! And, boy does he have personality! You can just tell. I just wanted to let you know that I am a proud owner of a pure bred Brussels Griffon named Stewart. So ironic! He likes wearing clothes also, especially hooded sweatshirts. He is super snuggly. He loves to burrow and sleep under the covers with me, and he also likes to be held like a baby. I usually kiss him on the mouth. Sometimes I can’t help myself and I just have to bite him. He doesn’t mind! I’d love to send in some pics of him. How shall I go about doing so? Ps Stewarts bff is a cat named Ollowichish. OH MY GOD, that dog is adorable.